Televisions - Flint Audio & Video - 4K, HD, Curved & more! Find the Right Fit for Your Home. Purchasing a television today can be confusing. OLED, QLED, LCD, HDR, 4K, LED, LCD, what does it all mean? At Flint Audio Video we enjoy listening to our customers needs and educate them on the best purchase for their home. We take the stress out of the buying process and make it an enjoyable experience. From the first “hello” in the store to the tech delivering you new set, we do it all with a smile. Knowing you’re not buying old technology is important, and you can be sure that Flint Audio Video will always stock the latest television technology in our store. 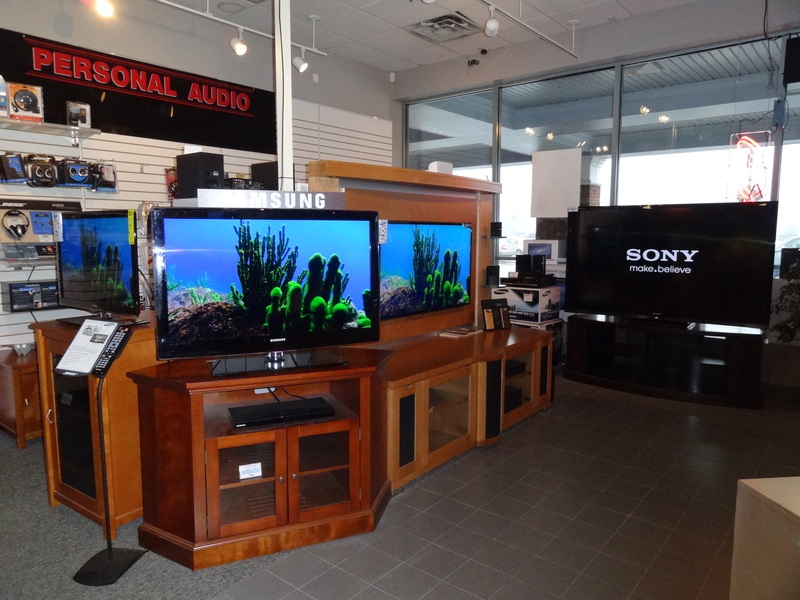 We sell and stock name brands like Sony, Samsung, and LG – name brands you can rely on. Our sales staff is well trained in the differences between the latest products and will always give you a thorough explanation of what your are buying. Whether you are a seasoned technophile or a total technophobe, we make sure you are comfortable throughout the entire process. “Unmatched Service, Competitively Priced!” This is our motto, and we stick to it! Flint Audio Video offers free delivery, set-up, and networking on most of our TVs. 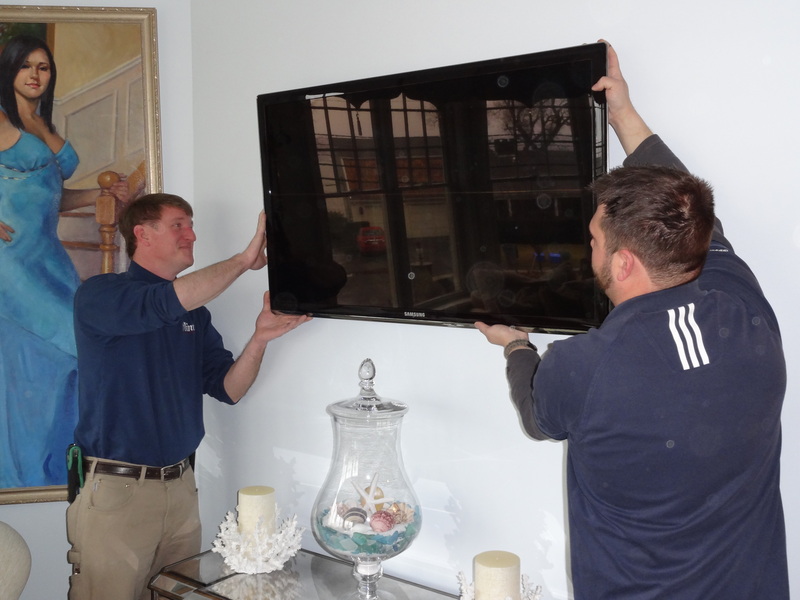 Our professional installation team can install your TV on almost any surface and run all your wires through the wall, keeping the install organized and clean. Make.Believe – Sony wants you to enjoy the most magical experience possible while watching TV. That’s why they take the latest technology in television and put it into every set they produce. When you watch a movie or TV show, there’s a pretty good chance it was filmed with a Sony camera, produced by Sony, and distributed by Sony. Bring home the brand that’s there from beginning to end: Sony. Innovation meets style – Samsung is the creator and leading manufacturer of the “Smart TV,” a cutting edge brand with reliability attached. Easy to use WiFi interfaces, stunning 4K picture, and sets to meet every budget, Samsung has the end user in mind. Stop by Flint today to have one of our professional sales associates walk you through the different models available and explain the tremendous value you’ll get from a Samsung set. In recent years, LG has emerged as a leader in high-end televisions. Pioneering OLED technology, LG quickly became recognized for its unbelievable picture. 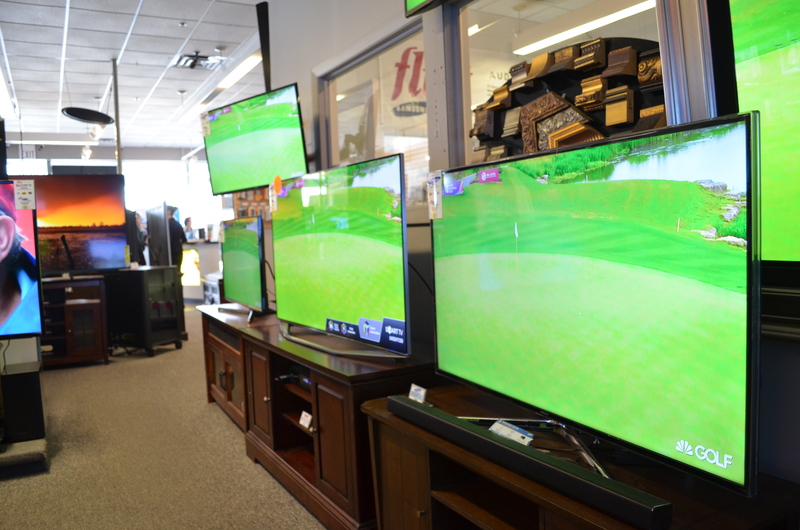 This trend in quality has carried over to all of its 4K and HD televisions, which is why we’re proud to have the brand’s latest sets on display in our stores. Stop in today and see for yourself just how stunning an LG picture can be. What’s the difference between 4K/UHD and 1080p/full HD? 4K, or Ultra-High Definition (UHD), and 1080p, or Full HD, refer to the resolution of a television. Resolution is measured by counting the rows and columns of pixels across the screen. A regular (non-high definition) TV has 460 columns by 360 rows of pixels. A full HD TV has 1920 columns by 1080 rows, hence 1080p. 4K is the latest standard in screen resolution, measuring 4,096 columns by 2,160 rows. The result of this increase in pixels gives 4K televisions four times the number of pixels on screen than 1080p televisions. What is a “Smart” TV? A Smart TV simply refers to a television having the ability to connect to the internet in a “Smart” way. Smart TVs are built with a WiFi receiver to pick up the wireless internet signal in your home. Having internet in your television enables it to run streaming services like Netflix, Hulu Plus, and YouTube without having to connect any other devices to your TV. Nearly all UHD TVs today are “smart,” but this does not mean that you need wireless internet for the television to work properly; it simply means that if you do, you will have access to these additional features. You won’t have to worry about setting up your Smart TV though, because our technicians will deliver, set-up, and network most televisions free of charge. HDR stands for High Dynamic Range. Televisions with HDR technology can produce much a much wider range of contrast. This means the darks are darker and the lights are lighter than traditional high-definition televisions. What this results in for you, the viewer, is much more life-like video that more accurately reflects what the director intended. HDR technology is only available on UHD televisions. OLED (Organic Light-Emitting Diode), is a panel technology that has recently become available on televisions at a consumer price point. On OLED displays, each individual pixel creates its own light, rather than being back-lit by a matrix of LED lights as most LCD televisions are. This results in a stunning increase in contrast, bringing a dynamic range to your screen that has never been possible – until now. QLED (Quantum Light-Emitting Diode), is a technology offered exclusively by Samsung. The brand’s QLED televisions use standard LCD panels, but back-lighting is supplemented by a layer of Quantum Dots, which emit a distinctive glow when hit by light. The result is a vibrant, gorgeous image that is on par with what you would see on an OLED display – and available at half the cost of one.